There are few leaders who have as good a reputation as the Roman Emperor Marcus Aurelius. He is almost universally lauded, with one of the world’s most famous historians – Edward Gibbon – even claiming that his reign coincided with the ‘most happy and prosperous’ time in human history. Recent historians have disagreed with Gibbon’s assessment. Most of the Empire’s slaves under Marcus would not have described their condition as happy and prosperous. Rome also suffered from military problems and natural disasters, such as the outbreak of plague which is at the centre of my novel Dead Romans. Still, Marcus Aurelius is looked upon kindly even today. He is considered an exemplary leader and people continue to learn from him. His book Meditations is still read and followed as an excellent guide to life. His examples could also give us invaluable help on solving government crises, such as what is happening in Europe with Greece. The Roman Empire did not have a financial market as we know of today. Cities, provinces and the central imperial administration rarely, if ever, borrowed money. So their financial crises were normally cash or liquidity crunches, and not overleveraging like with Greece. 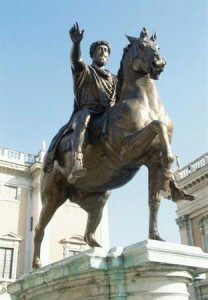 Still, some of the same tools Marcus Aurelius used could be dusted off and utilised in the modern era. Marcus devalued the denarius, the silver coin used by the Empire. Greece has been attempting to force itself through an internal devaluation, but some economists say they should leave the Euro and devalue a new currency to make their products more attractive internationally. When strapped for cash Marcus engaged in privatisations of a sort, by selling imperial possessions in a public auction in the Roman Forum. Not surprisingly, the IMF claims that Greece’s reluctance to privatise state assets is one of its biggest problems. They have undershot their goal by 94%, which shows how poorly they have managed. The Emperor also forgave unmanageable debts to the imperial treasury. Again, this is one of the main suggestions of the IMF in regards to Greece. In contrast to Marcus and the advice of the IMF, Europe continues to try and manage the situation to service the debt, instead of managing the debt to match the economic situation. Marcus also made grants to local municipalities which needed financial help. For some reason this is anathema to modern Europeans. It is perfectly acceptable for my tax money to help someone I’ve never met in Lapland, but unthinkable for my taxes to flow from Helsinki to Athens. Marcus Aurelius is a shadowy background figure in my novel, only appearing through how other characters think of him, yet he influences much of the action. When it comes to the current Greek catastrophe his influence should still guide our actions. Some of his policies could be used, but more importantly we need his attitude. He was generous, understanding and practical. Those qualities are exactly what we need going forward.